After showcasing an elaborate Ugadi feast that we had, I was almost shy to share my own simple brunch we had on the Ugadi day. 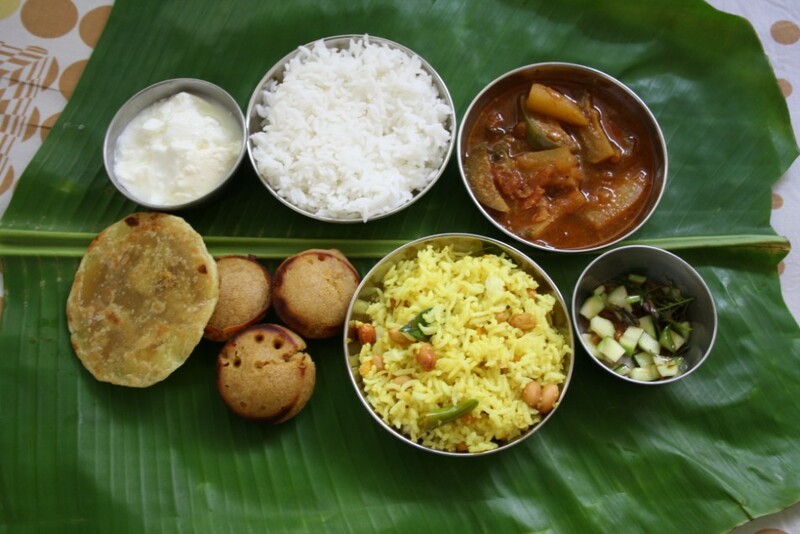 Traditionally we always have the Ugadi pooja by morning and end up having a brunch. Then have a late afternoon meal. This year too it was same and I had only one new dish to share from the breakfast brunch. And that also had a funny story behind it. I have been planning to make Neiappam for a long time, I never came around making it for any of the poojas I planned. Unexpectedly I ended up making it on this day. Just couple days before this day, I made a chocolate brownie. I had to open a new packet of flour, and made a brownie. I never understood why the brownie didn’t hold its shape. I had no complaints on taste quarter as it was awesome, so who really cared about the shape, I thought. And on this day, when I was getting out to make the dough for the Poli, I took out the same packet and started mixing it. As I had used a spoon to scoop out the flour, I didn’t feel the texture. So happily I added the flour to the bowl and added ghee as well. Only on touching it, did it strike me that it wasn’t All purpose flour but instead Rice flour. I had to quickly transfer and made the dough for the poli using maida. Then I was thinking what I should do with the rice flour mixed with ghee. I remembered the Nei Appam. I always wanted to make with rice batter but well even with rice flour, the appams tasted great. Melt the jaggary in enough water and remove impurities. Keep it aside. In a bowl, take the rice flour, mashed banana, a pinch of salt, cardamon powder, cooking soda and the melted jaggary. Mix in slowly making sure there are no lumps. Add more water if required. The consistency should be of little thick. Set aside for at least 30 mins. Heat paniyaram pan with little ghee in each hole. Pour a spoon full of the batter in each hole. Cover with a lid, simmer for couple of mins. When cooked on one side, carefully flip to other side – add ghee if required. Cook on both sides till they turn golden brown. Remove using the wooden spoon. Since this recipe uses flour, I used cooking soda to make the batter soft. If you don’t have paniyaram pan, you can deep fry them by pouring a spoon full of the batter in heated oil and deep fry them until golden brown. Please make sure you don’t use lot of water while mixing, as it will drink more oil. Adjust the consistency after resting it for a while. If you are deep frying the appams, then you can use half oil and half ghee to fry the appams. 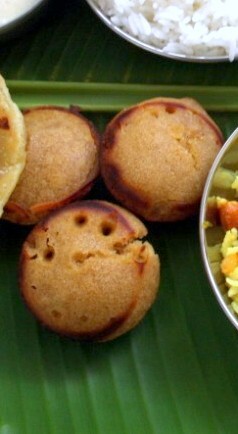 Cute and damn attractive neiappams, i dont mind eat some rite now, seriously makes me hungry even after having my dinner. My favorite too,looks perfectly made. Quick thinking Valli. I would probably have ended up calling my mom at some weird hour to ask her what to do with the batter!!!!!! one of my fav dishes too.. i can gorge on these.. they have nice round shape too! Nice way to salvage the mixed flour, Valli. The appams looks great..a real treat. sweet and yummy!….they look tempting and yum!! They look so perfect and tempting too .. Cute appams!!! Tried both deep-fried and the pan-fried appams, though deep-fired are higher on the calorie, love that taste!!!!! Delicious nei appams.. Made once and everyone at home simply loved it. I love neiappams…have you tasted one of the neiappams from Iyappan temples? Amazing ….looking at yours I'm reminded of those appams. Lovely spread Valli…looks awesome. Cute and sweet onece I keep on eating them whole day. I have never heard of this item. Looks cute. And quick thinking on your part. I should give them a try Valli. They look cute.